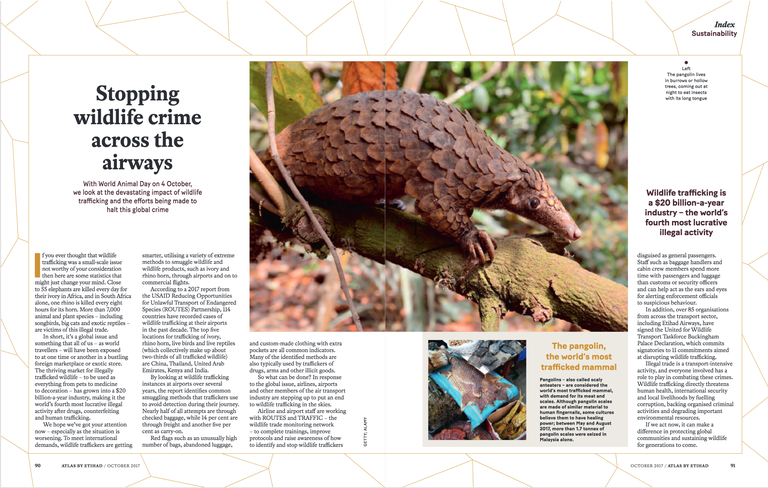 With World Animal Day on 4 October, Etihad Airways' in-flight magazine looks at the devastating impact of wildlife trafficking and the efforts being made to halt this global crime. If you ever thought that wildlife trafficking was a small-scale issue not worthy of your consideration then here are some statistics that might just change your mind. Close to 55 elephants are killed every day for their ivory in Africa, and in South Africa alone, one rhino is killed every eight hours for its horn. More than 7,000 animal and plant species – including songbirds, big cats and exotic reptiles – are victims of this illegal trade. In short, it’s a global issue and something that all of us – as world travellers – will have been exposed to at one time or another in a bustling foreign marketplace or exotic store. 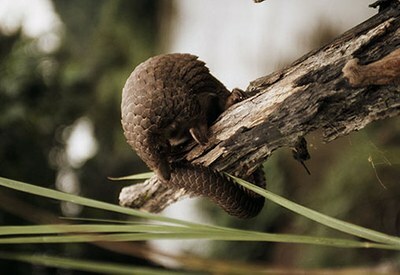 The thriving market for illegally trafficked wildlife – to be used as everything from pets to medicine to decoration – has grown into a $20 billion-a-year industry, making it the world’s fourth most lucrative illegal activity after drugs, counterfeiting and human trafficking. We hope we’ve got your attention now – especially as the situation is worsening. To meet international demands, wildlife traffickers are getting smarter, utilising a variety of extreme methods to smuggle wildlife and wildlife products, such as ivory and rhino horn, through airports and on to commercial flights. According to a 2017 report from the USAID Reducing Opportunities for Unlawful Transport of Endangered Species (ROUTES) Partnership, 114 countries have recorded cases of wildlife trafficking at their airports in the past decade. The top five locations for trafficking of ivory, rhino horn, live birds and live reptiles (which collectively make up about two-thirds of all trafficked wildlife) are China, Thailand, United Arab Emirates, Kenya and India. By looking at wildlife trafficking instances at airports over several years, the report identifies common smuggling methods that traffickers use to avoid detection during their journey. Nearly half of all attempts are through checked baggage, while 14 percent are through freight and another five percent as carry-on.